Plastic worms are used as effective trout lures across the globe. 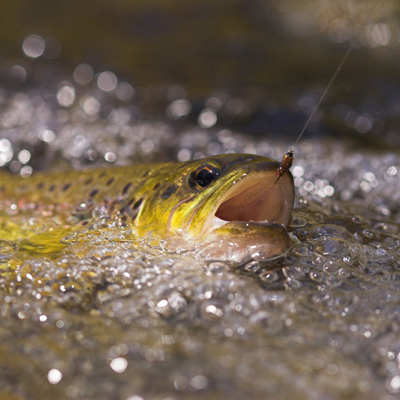 However, it is extremely important to use the worms properly to fish trout. If you want to fish trout with worms, you will need to drag free drifts and other sensitive fishing equipment. Experienced fishermen can very quickly learn to differentiate the gentle knocking of the weights along the bottom. Fishing trout with worms is convenient and less expensive than other fishing methods. The only disadvantage attached to this method of catching trout is that you will be able to cover as much territory when compared to typical boat fishing. Consider attaching split shot to the fishing about three to four feet from the tag end of the line. The water you are looking to fish usually determines the size of the split shot. Size 5 and size bb for split shot are commonly used when fishing trout using plastic worms. Now connect a hook at the end of the fishing line. This can be done by using an improved clinch knot. As a rule of thumb, plastic worms you intend to use and the hook should be of the same size. It is recommended to use size 10-14 hook as most trout worms work great with this size. If you are planning to use bigger worms then consider using size 8 hook. Worm can be attached to the hook by inserting the hook through the centre of the worm. Press in the hook to thread the worm. Split shot rig out in the direction of a likely location. You should wait for the sink shot sinker to take the worm to the depth at which you want to fish trout. According to a research, the best way to finding the right depth is counting as worms start to sink in water. If you catch trout at a certain depth count, you can catch more successful by counting down the same depth in other directions. Reel the line and impart irregular jerks to retrieve the worm. When you feel the trout has caught the worm or the fishing line starts moving, you should consider dropping your rod tip to release the pressure on the line. This can also prevent the trout from dropping the worm. Use a quick upward snap of your wrists once the tension on the line is reduced. Your Puppy’s Ears: To Crop or Not to Crop? Flea and Tick Treatments: Are You Poisoning Your Pet?